I can never have enough books. Though the public library is a valuable asset to any community, I always have overdue fines because I never return books on time. It’s actually another case of my nature distraction disorder–only book related. Thankfully, we have an independent bookstore, Bridgton Books, that feeds my reading habit. Justin and Pam Ward are the owners. They, and their sidekick Sue, keep adding to the choices and go out of their way to help me find books that may not be in stock so that I can continue to add to my bookshelves. Below is an array of books that I reference frequently. The list will continue to grow. I’ve not included all here and I know I’ll continue to purchase more, so check back every once in a while. And if you have a recommendation, please share it with me. 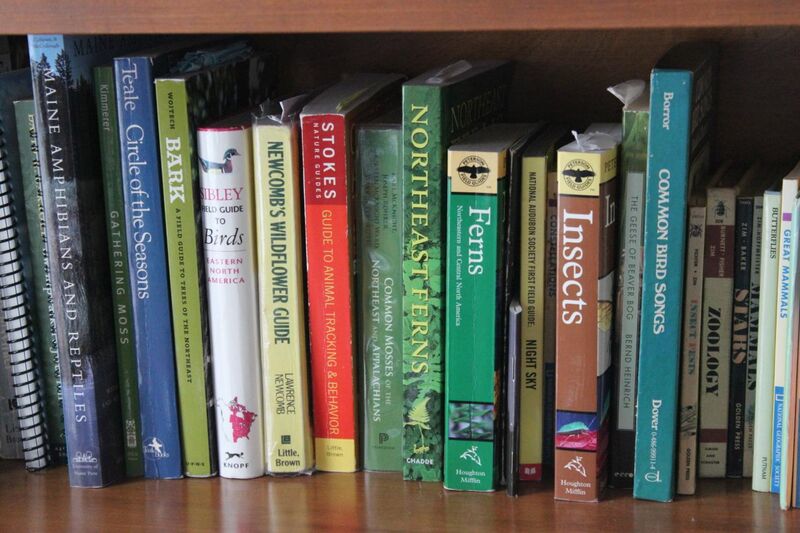 National Audubon Field Guide to New England, Peter Alden et al. Leigh, this list in incredible! The last few lines have gotten garbled, tho’. It’s just a formatting question. I think that Calder’s book is “Animal Sketching”, the Richmond book is “Sketching Out of Doors”, and the Hamilton book is “The Complete Sketching Book”. I think I have a couple of books that you don’t, but I have a 16 lb cat resting on my forearms at the moment! Hi Ann, I welcome your suggestions for books. Can never have enough 🙂 Until it’s time to sell the house and move, right? And yes, I added those sketching books as an after thought and wondered if they would be garbled. I’ll either fix that or delete them. Thanks for letting me know and thanks for your continued support of this blog. Great list! Many of my favorites are listed – and many more to look for. Thank you! Three others I absolutely love are “Bird Feathers” by Scott &McFarland, “Bird Track & Sign” by Elbroch, and “Tracks and Sign of Insects” by Eiseman and Charney. Just found your blog and looking forward to many hours of fun. Thanks so much for stopping by. And thanks for book suggestions. We can never have enough books . . . or time to spend wondering and wandering. Just curious–how did you find the blog? I hope you’ll return often and share with family and friends.